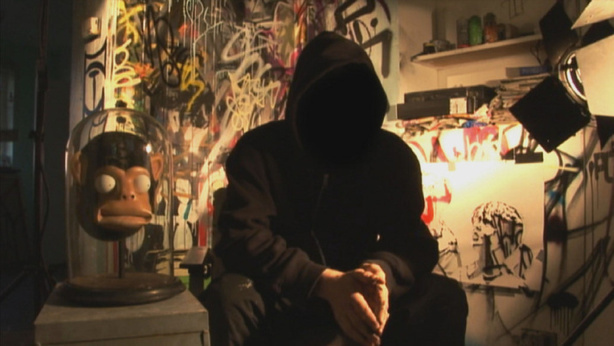 Infamous street/graffiti artist Bansky directs this film that starts as a documentary purported to illustrate him and morphs into the making of a new art world sensation, MBW (Mr Brainwash); the French shop keeper, Thierry Guetta. Thierry spends every waking moment video taping well, everything in his life. This hobby eventually crosses into the world of graffiti artists, thanks mainly to the fact that his cousin is the infamous artist, Invader. His nocturnal outings eventually lead him to the mysterious Bansky, who takes him on as a comrade-in-arms. When Bansky finally asks to see the documentary Guetta has been making, the dreadful result is enough to have him ask Guetta to return to Los Angeles and take up graffiti full time; thus leaving the raw footage in Bansky's hands. At this point the film turns into a film about the creation of Mr Brainwash and the uber show he constructs jumping off from where Warhol left off. Exit Through the Gift Shop is a thoroughly engaging film; a shred marketing move on Bansky's part; and a glimpse into the vacuous world of modern art and what it means to be 'an artist' in this day and age.